. : Optics & Photonics Focus :: Journey to the Center of the Earth :. Truly Random Results: You Can Bet on It! What happens when we put an electric insulator, such as iron oxide, under pressure and temperature conditions as extreme as those of the Earth’s interior? 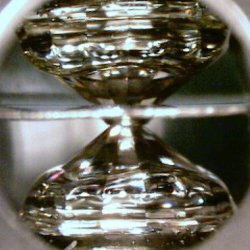 The insulator turns into a conductor: a notion that will help us to refine our current understanding of the Earth’s magnetism. Metal or Insulator? The image shows the charge density in the rock-salt structure of FeO. At room temperature and pressure this mineral is electrically insulating, but at the temperature and pressure conditions of Earth’s lower mantle it behaves like a metal. Image courtesy: Robert E. Cohen. Entertaining, caring, protective… all the characteristics that would make a partner seem attractive. And, just like a loyal partner, the Earth’s magnetic field amazes us with the Northern Lights, guides navigators by making compasses work, and caringly shields us from harmful cosmic rays. Now, the discovery of a new metal-like material, at temperature and pressure conditions similar to those of the Earth’s lower mantle, sheds new light on our understanding of the origin and behavior of the Earth’s magnetic field. These are the concurrent, yet independent findings of two distinct international teams of researchers, here represented by Ronald E. Cohen at the Carnegie Institution of Washington (Washington DC, USA) and by Rebecca A. Fischer at the University of Chicago (Illinois, USA). We can think of our planet as a layered onion, where things get more extreme, in terms of temperature and pressure, as we move towards its core: the solid surface, or crust, which we live on is followed by a rocky upper mantle; beneath that, composed of plastic flowing rocks, lies the lower mantle; then, finally, the liquid outer core and the solid inner core with temperatures reaching more than 5000 degrees Celsius. This is the structure we have been able to deduce based on theoretical assumptions, or indirect experimental observations. Of course, if we were characters from Verne’s Journey to the Center of the Earth, we would be able to travel inside our planet and assess this model directly. Unfortunately, the reality is rather more complex and even though we cannot simply stroll down to the core of our Planet, new pieces of evidence are constantly added to the puzzle. A hot compression. 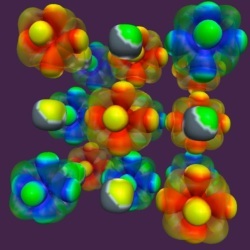 A magnified image of the anvil diamond cell used by the researchers to recreate temperature and pressure conditions comparable to those in the lower mantle of the Earth. In the picture, a very thin foil of iron oxide is compressed between the tips of two diamonds. Picture courtesy: Andrew Campbell. The origin of the magnetic field of the Earth is one of the assumptions based on theoretical models and indirect evidence. What generates the magnetic field? This "is generated in the outer core of our planet," explains Cohen . "This process is not completely understood but it is thought to be a dynamo effect." The current picture, in fact, attributes the Earth’s magnetic field to rotating electric currents in the outer core, which is mainly composed of highly conductive molten iron. Here, an important assumption is that the mantle is mainly made up of electrically isolating materials. "If everything between the surface and the core is insulating, as it is thought," Cohen adds, "then it is relatively easy to project space or surface measurements of the Earth’s magnetic field back to the core. Nevertheless, if there is a metallic layer, the magnetic field would be generated differently, depending on the distribution of this layer." The new result seems to indeed suggest the existence of such a metallic layer: iron oxide (FeO), an important mineral in the Earth’s lower mantle, converts from an insulator to a metal at high pressures and temperatures, similar to those found in the interior of the Earth. "FeO is a very important mineral in the Earth," Fischer points out. "The second most abundant mineral in the Earth’s lower mantle is ferropericlase, which is a solution of MgO and FeO. Additionally, while the Earth's core is mostly comprised of iron, we know that it also contains several weight percent of one or more lighter elements, and oxygen is a leading candidate. So FeO might also be a component of the Earth's core, especially the outer core. Understanding the properties of FeO can therefore help us interpret seismological, geodynamic, geomagnetic, and other types of data we have on the Earth's deep interior." A layered onion. 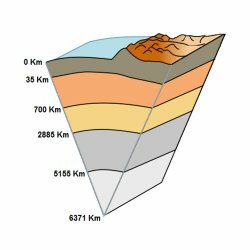 Our planet can be divided into five layers: crust, upper mantle, lower mantle, outer core, and inner core; things get more extreme, in terms of temperature and pressure, as we move towards its core. Adapted from Wikipedia/Surachit. To observe the transition of iron oxide from insulator to metal in a laboratory, the two independent teams of researchers had to recreate temperature and pressure conditions comparable to those in the lower mantle of the Earth: several million atmospheres of pressure and several thousand degrees Celsius of temperature. These extreme conditions can be achieved using a diamond anvil cell: the idea is to press a very thin foil of iron oxide between the tips of two diamonds, so that the sample is compressed to very high pressures, while heating it up using infrared lasers. In this way, the researchers were able to observe a change in the electronic properties of the mineral. "This transition was not exactly unexpected," Fischer clarifies. "Metallic FeO was first reported in the late 1980s in samples that had been shock compressed. However, this metallization was previously thought to coincide with a structural transition." The new study shows that this is not the case! The transition to metal occurs independently of structural changes. Moreover, metallic iron oxide is stable at the pressures and temperatures of the Earth’s interior." What is clear, as Cohen suggests, is that these findings may lay the foundations for a better understanding of the Earth’s magnetism, and offer new insight into its many poorly understood aspects. "The deep interior of the Earth and planets are real mysteries," Sabine Stanley at the University of Toronto (Canada) comments. "They have extreme conditions that are hard to simulate in the lab and on computers, but researchers are getting better and better at this. As we learn more about Earth's deep interior, we will be able to better understand Earth's structure and evolution in time." And Cohen concludes: "We used to think that the Earth was a metallic core surrounded by an insulating layer. Now, we see first evidence that this is not the case, and this will influence the way we think about the Earth’s magnetism and its impact on life itself." Ronald E. Cohen worked on the theoretical side of the research, while the experiment was performed by Kenji Ohta at Osaka University in Japan. Kenji Ohta, R. E. Cohen, Kei Hirose, Kristjan Haule, Katsuya Shimizu & Yasuo Ohishi, Experimental and Theoretical Evidence for Pressure-Induced Metallization in FeO with Rocksalt-Type Structure, Physical Review Letters (2012) 108, 026403 (link). Rebecca A. Fischer, Andrew J. Campbell, Oliver T. Lord, Gregory A. Shofner, Przemyslaw Dera & Vitali B. Prakapenka, Phase transition and metallization of FeO at high pressures and temperatures, Geophysical Research Letters (2011) 38, L24301 (link).